The modern wings are based on the Henry “Hap” Arnold wings, proudly worn by the Army Air Forces during WWII. The bent wings with a star and circle are meant to symbolize the service’s heritage. Making up the top half of the symbol, the wings signify the enlisted men and women of the Air Force. Arguably, the most meaning-packed section is the center star. The five points of the star stand for each component of the total force and family: Active Duty, Civilians, Reserve, Guard and Retirees. In addition, the star represents the Air Force’s space force, as well as representing the officer corps that leads the service. 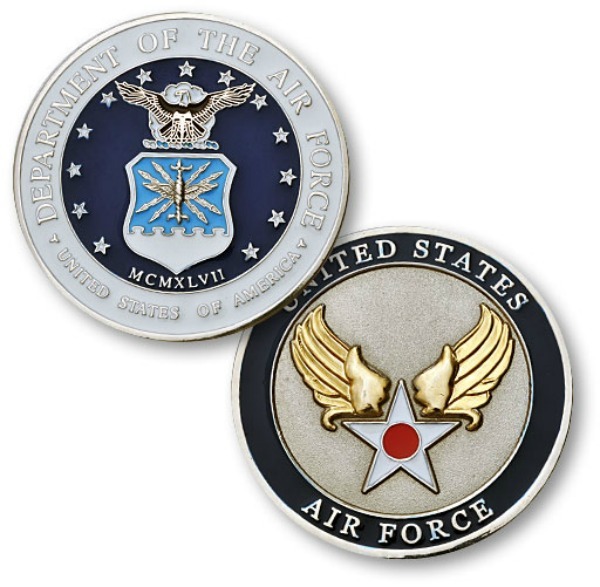 The coin is minted in solid nickel and given a beautiful baked enamel finish.